Fight the damaging effects of the environment that cause dry skin and keep hands and cuticles soft with this concentrated hand cream. Cocoa and shea butters, apricot kernel oil, aloe, and beeswax lock in moisture as Intensive Hand Therapy refines with mulberry and bearberry leaf and protects with green-tea and whole-grape extracts. Ingredients / Ingredients: Water (Aqua), G)ycenn, Glyceryl Stearate. CVopentasiIoxane. Theobroma Cacao (Cocoa) Seed Butter, Tflisonoriaooin, Limnanthes Alba (Meadowtoam) Seed ON, Betaine, Stearic Acki. Bet,en)1 Alcoh, Stear1 Alcchd. Pnmus Armeniaca *prIcot) Kernel ON. Glyceryl Laurate, Dimeucone. Beeswax. bopropyl Mynstate, Hydrogenated Pyisobutene. Undecylenoyl Glycine, Butyrospermum Pad’H (Shea Butter) Extract. Vitis Vindera (Grape) Seed ON, Cetearyl Alcohol, Ceteareth-20, Cap1o,l Gfycxte, Sodium Hydrude, AcrylateslClO-30 PJkyl Acrylate Crosspolymer Butylene Glycol, Pentylene Glycd, DisodiLan EDTA, Tocopher)l Acetate, Proline, Glycine, Tetraflexyldecyl Ascorbate, Stearyl Glycyrrtietinate. Magnesium Ascorbyl Phosphate, ONsopropyl Dirner DdflNeate, Moms Nigra Bunt Extract, Sodarn PCAVIfls Vmifera (Grape) Fruit Extract. Sarnbucua Nigra Rower Extract Echinacea AJ9USIItOIIa Extract. Chondrus Crispus (Carrageenan) Extract Centella Asiatica Leaf Extract, Camelia Snensis Leaf Extract Malva Sytvestris (Mallow) Extract, Sea St Sorbitol, Glycine SoØ (Soybean) Proteki. Manganese PC& Magnesium PCA. CcIum PCA. Serkie, Tocopherol, ThreonWie, Arctostaphylos Uva Ursi Leaf Extract. Retinyl Palmitale, Lysme, (itamIc Acid, Aloe Batadensas Leaf Juice, Alanine, Arginine, Oryzanol, Fragrance (Pailum). 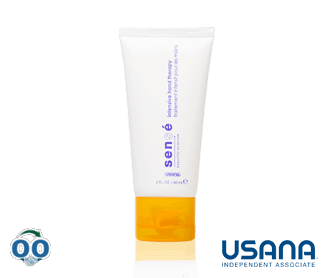 The information and services published on the USANA Web Site may contain typographical errors or technical inaccuracies. Information may be changed or updated without notice. USANA may also make improvements in and/or changes to the information described in the USANA Web Site at any time without notice. USANA is not responsible for any errors or omissions in the USANA Web Site or any web site which may be referenced within or linked to the USANA Web Site. This information and advice published or made available through the Topnutritionalsupplements.usana.com web site is not intended to replace the services of a physician, nor does it constitute a doctor-patient relationship. Information on this website is provided for informational purposes only and is not a substitute for professional medical advice. You should not use the information on this website for diagnosing or treating a medical or health condition. You should consult a physician in all matters relating to your health, and particularly in respect to any symptoms that may require diagnosis or medical attention. Any action on your part in response to the information provided in these web sites is at the reader’s discretion. All Legal information are here and it is your responsibility to read and agree if you want to use this website or buy or use the products.